Blog Guidebook: Wanna be a winner? CLOSED! KEEP A LOOKOUT FOR OUR NEXT GIVEAWAY! 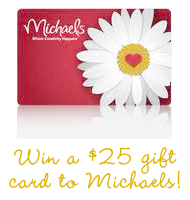 Thanks for clicking on the button to win a gift card to Michael's! We wanted to give something to that special creative someone who is always joining in on the blog hops and linky parties...that someone who really could use a $25 boost! 2. Leave a comment on this page saying you added your project. 3. Let us know you are a follower or become a follower by leaving an additional comment on this page with your email address. A winner will be chosen from all qualifying entries on Monday, September 20th at noon. The winner will be notified via email and their name will be stated in a post here at the Blog Guidebook. If we don't hear from the winner we will draw a new name. Have fun on the Chick Parade and let us know what you think! thanks for co-hosting such a neat event! Left a sewing project and a sewing embelishment we use for scrapbooking at Thingamabobs and Doodads. all the furniture entries are great, but I love the bookcase made into a kitchen, the floral chair makeover, and the patio bench. i recently discovered this blog and love it! i'm following! I'm a follower and I'm sending a recipe! Left a recipe and a Mod Podge project! Also follow on GFC! This blog is such a good resource. Love it! I am a follower and I left a Recipe! I am a follower already, and love your blog...it's SUPER! Oh, I also LOVE this site! I left a before and after project.